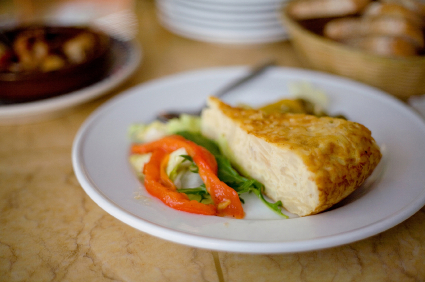 Omlettes, they’re not just for breakfast anymore. A quick and elegant solution for the unexpected dinner guest or the dreaded “I’m too burnt to cook” syndrome is the classic Spanish bar tapa: the Tortilla Espagñola. This is the quick (cheating) version that we use most often (Sorry Iñigo…) Serves 4. Find a good, small, round high-sided casserole dish that you can put in the oven. You’ll also need a skillet. Oil the inside (and the walls) of the casserole. Fry the frozen Potatoes O’Brien in the skillet in some olive oil with salt until they are soft. Stop when they are just about to turn color. Break the eggs into the casserole dish or pour in your egg substitute and beat until frothy. Add salt and pepper. Pour the hot potatoes into the eggs and mix together. The eggs will begin to set. Put the casserole into the oven and wait until the top has risen (with luck!) and is golden. Remove and let cool. Invert it onto a plate and cut into triangles like a pizza. Serve with a good red (tinto!) crusty bread and a salad. This entry was posted in Entertaining and tagged dining, dinner parties, Entertaining, recipes. Bookmark the permalink.